I was the 2013 Highpoint Academy Rider for the American Saddlebred Horse Association of Alabama. I had something else planned for today, but I just had to tell you. I was kinda, sorta sure that I had won both of my divisions: Academy Equitation Walk-Trot Adult and Academy Showmanship Walk-Trot Adult. Even through my horse show haze, I knew I had not been seeing the same faces from show to show. I was NOT expecting the overall. The barn also had a good night. All the show horses won, except Lola who took second to Alvin: five-gaited, three-gaited, equitation, and a variety of pleasure divisions. Three other SSF Academy riders took their divisions: two WTC teens & a WT munchkin. My instructor’s daughter, Reagan Hughley, won several performance divisions and took Highpoint something. I was too busy beaming to hear exactly what it was. A third, non-Stepping Stone rider, joined us for the presentation photos. So SSF took two of the three rider Highpoints. Stepping Stone also took Highpoint Performance Barn and Highpoint Academy Barn. Four of five Highpoint awards! Go us! As winner of the Performance Highpoint, SSF nominated a person for the state Hall of Fame: a well-known mom who had been a long-time supporter of Saddlebred showing in the state. As winner of the Academy High point, SSF nominated a horse for the HoF: Alvin Ailey. During his praise poem, it was mentioned that he could do performance, driving, and academy classes … in the same show. This last fact merited a genteel gasp of interest from the audience. If they only knew! He not only does all three, he wins all three … at the same show. At Mid-Summer [Show Report], Alvin won the Natural Country Pleasure Championship, the Academy Pleasure Driving, and three Academy Walk-Trot classes, including the championship. What a horse. I got a little damp around the incipient crow’s feet. Then photographs. Lots and lots of photographs, as each barn gathered in front of the presentation panel for their group shot. There is a properly formal photo with us looking at the camera, but this is me fumbling three ribbons & two trophies. 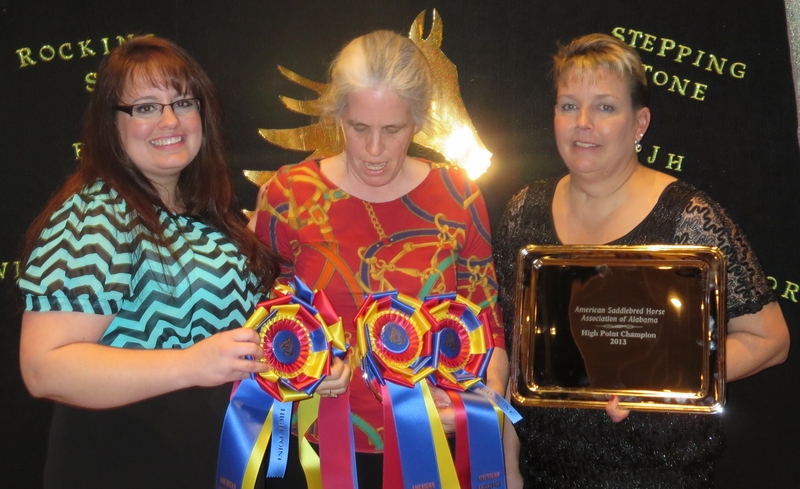 My charming companions, Assistant Trainer Melissa Croxton & Head Trainer Courtney Hughley, are holding barn awards. Photo by whichever kind soul grabbed my camera. 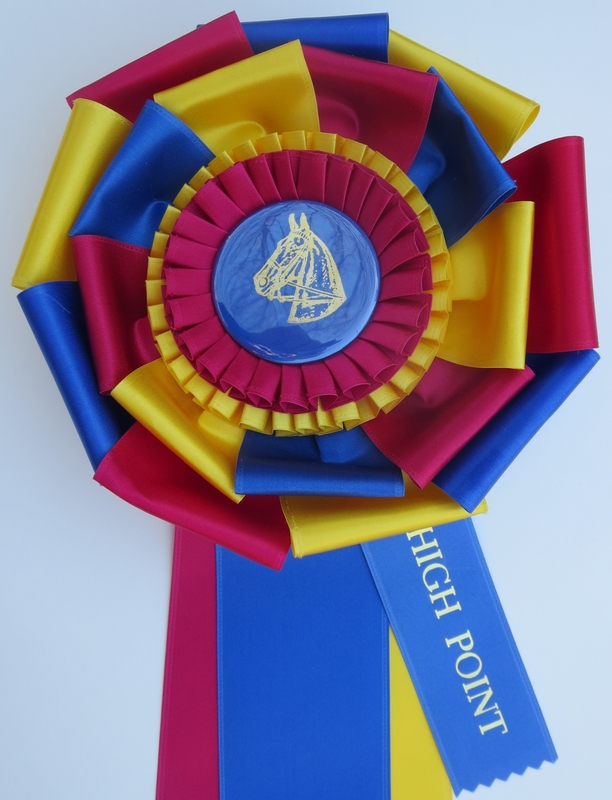 Snide me: The overall highpoint is an indication that I spent WAY too much money on horse shows on 2013. Update from my instructor: Reagan won the Adult Country Pleasure, Adult Equitation and Overall Highpoint Amateur Rider award. We didn’t get the Overall Highpoint Juvenile Rider Award. In the State Pleasure Horse awards given by ASHA, we won the Juvenile Country Pleasure, Adult Country Pleasure, Country Pleasure Driving, Juvenile Five-Gaited Pleasure and Adult Show Pleasure. We did not win the Show Pleasure Driving and the Juvenile Show Pleasure. In my defense, we did not have anyone showing in those classes and also did not win the Adult Five-Gaited Pleasure. Did not have anyone in that either. Don’t forget our rider who won in Leadline! OK, everyone won in Leadline, but it still counts. Way to go Katherine!! Congratulations! Good thing you wore a REALLY nice shirt! Congratulations, champ! I like how the shirt coordinates so nicely with the ribbons! Love the shirt and the foof! Congratulations! Great smirk! Well done you. Well done Stepping Stone too – and high praise to Alvin the Awesome. He really is one of the most versatile horses around and well deserves Hall of Fame. Congratulations! Money spent on horseshows where you enjoy yourself is money well-spent. Ditto to all of the above 🙂 Enjoy the Squeee for a long time yet to come!